All products of The Soft World are handmade by the century old technique of felt making, so this means every piece is unique. All products are made by the team of The Soft World in Holland, in Beatrice Waanders studio in a former boathouse of the big harbor along the river Maas in Rotterdam (The Netherlands). Beatrice works also with interns from the Rotterdam academy of art (WDKA) and with people from the Pameijer foundation (mental health clinics). All together they keep alive old crafts like, felting, carding and spinning. The Soft World does not use chemical products, neither by the felting process nor in the finish. Water, olive soap and muscles is all she uses. The products of The Soft World are completely animal and environmentally friendly. None of the wool is even dyed, The Soft World exploits the rich color palette of the animals themselves. Therefore The Soft World uses the wool from old forgotten European sheep breeds, goats, alpaca’s, rabbits, all living in Holland. The Soft World is unique in felting traditional luxurious materials such as angora, alpaca, cashmere, camel and silk in her own innovative technique. 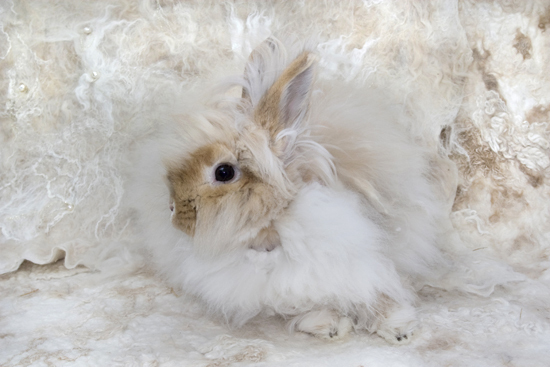 The concept of felting the raw and un-dyed wool of many special sheep breeds in combination with the hair of other animals is unique worldwide.